It should not be a surprise the New York Mets needed almost a decade to find their footing in the National League, considering they were born in an atmosphere of contentiousness. They had to fill the spikes of two storied franchises, and they had to compete for fans and media time in the same city as the Yankees, the game's most successful franchise. When the Brooklyn Dodgers and New York Giants vacated New York City for the west coast in the late 1950s, it left America's largest city with no National League team. When baseball's hierarchy showed no urgency in filling this gap, a New York attorney named Bill Shea teamed with notables including Branch Rickey and proposed a third major league called the Continental League, featuring an anchor franchise in New York City. After more than a year of rancorous negotiations, Major League Baseball suppressed the potential competition of a new league by agreeing to award a franchise to New York City as part of a four-team expansion. In return, Shea agreed to shut down the Continental League. Thus in this turmoil was born the New York Mets in 1962. The team immediately tapped into nostalgia by populating its roster with veteran New York baseball stalwarts including Casey Stengel as manager, Gil Hodges, Gene Woodling, Don Zimmer, and eventually Duke Snider (in 1963) and Yogi Berra (1965). These past-their-prime players combined with an unimpressive first generation of prospects to drag the Mets to a 40-120 inaugural season, still a record for futility. While their second season record of 51-111 could be seen as equally dismal, it was a 10 game improvement in the standings. After these two seasons in the creaky Polo Grounds, the Mets moved to Shea Stadium in 1964. A few seasons later, a glimmering batch of pitching prospects began making their way to the major league roster and eventually turned the Mets from laughing stock to prime stock. Tom Seaver and Jerry Koosman were the vanguard of the Mets' pitching armada, which also included Gary Gentry, Jim McAndrew and a fire-balling rookie named Nolan Ryan. In 1969, they led the Mets to an improbable world championship, forever earning them the moniker "Miracle Mets." The team stayed in contention through the first half of the year, and then went 44-18 in their last 62 games to leave the favored Chicago Cubs in the dust. Incredibly, 17 of those wins were shutouts. The Mets swept the Atlanta Braves out of the first ever National League Championship Series in three straight and humbled the Baltimore Orioles in the World Series in five games. Seaver (25-7, 2.21 ERA), and Koosman (17-9, 2.28) led the pitchers, and Cleon Jones (.340) led the hitters. Mid-season pickup Donn Clendenon added much needed punch to the middle of the batting order and he delivered key hits in the Series. During the next few seasons the Mets hovered around the .500 mark, boasting superior pitching but hampered by an anemic offense. In 1973, their mediocre performance (82-79) was enough to steal the 1973 National League East crown, with Seaver (19-10, 2.03) leading the way and veteran George Stone (12-3, 2.80) making the critical difference. The underdog Mets took out the Reds in a rousing five game NLCS, but lost to Oakland in a seven game World Series. The Mets followed with three middle-of-the-pack seasons, and when ownership decided it did not want to dole out the dollars required to attract and retain pennant-contending talent, stars such as Seaver, Koosman and slugger Dave Kingman (73 home runs in two seasons) were traded away, condemning the Mets to a miserable run of five last place and two fifth place finishes in seven seasons. The Mets rebirth began in 1980 when Fred Wilpon and Frank Cashen took over the team. Soon, the Mets had a new stellar crop of pitching arms in Dwight "Doc" Gooden, Ron Darling, Ed Lynch, Jesse Orosco and Sid Fernandez. Gooden went 17-9 as a 19-year-old rookie in 1984 and won the 1985 Cy Young Award with a 24-4 record and microscopic 1.53 ERA. This Mets staff had plenty of firepower to back it up, turning the team into a National League powerhouse in 1986 winning a franchise-best 108 games with manager Davey Johnson. Homegrown prospects such as Darryl Strawberry (27 home runs and 93 runs batted in), Wally Backman (.320) and Mookie Wilson (.289) mixed effectively with acquired veterans Keith Hernandez (.289, 13 home runs and 83 runs batted in), Ray Knight (.298) and Gary Carter (.255, 24 homers and 105 RBI). The Mets had all they could handle in the postseason, first defeating the Houston Astros with the series-clinching 16 inning sixth game considered a postseason classic. The Mets had a bumpy time in the World Series against the Red Sox, but the infamous Bill Buckner error allowed them to steal an improbable win in Game Six, and they won the franchise's second world title in Game Seven two days later. This impressive roster, which was soon bolstered by the addition of Kevin McReynolds and the emergence of slugger Howard Johnson, never reached the World Series again. Gooden and Strawberry were rendered ineffectual by drug problems, while age, bad trades and poorly conceived free agent signings (Vince Coleman, Bobby Bonilla) relegated the Mets to bottom feeders in the early 1990s. Dallas Green helped lead the team back to respectability in 1994-95 and Bobby Valentine took it to the next step, returning the Mets to contender status with a second place finish in 1998, and wild card wins in 1999 and 2000, the latter resulting in a World Series appearance against the cross-town rival New York Yankees. The Mets lost a subway series to the Yanks in five game. These teams were led by catcher Mike Piazza (40 homers, 124 runs batted in and.303 average in 1999; 38 home runs, 113 RBI and a .324 average in 2000). Led by pitchers Tom Glavine (15-7, 3.92 ERA) and Billy Wagner (40 saves, 2.24 ERA), and hard-hitting first baseman Carlos Delgado (38 homers, 114 RBI, .265 average), the Mets won the 2006 NL East Division crown and a division series playoff before losing a seven-game NLCS to St. Louis on a ninth inning home run. The Mets have used their first half century to establish their own traditions and a firm set of roots in New York. Though they have not won as frequently as their fans would like, their spirited teams and tradition of pitching excellence have helped New York wash away the bitter taste left by the defection of the Dodgers and Giants. 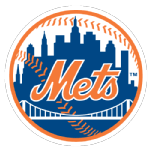 New York Mets Franchise Facts At-A-Glance on Baseball Almanac, Inc.
Did you know that on April 5, 1993 , the New York Mets set a team-specific record for largest attendance during an Opening Day game when 53,127 fans witnessed their Metropolitans shutout the Colorado Rockies 3-0? Struck me as Dad changed the channel to Nine. Blurring the line between comic and tragic. I fell in love with new New York Mets. Ending with recaps most often not happy. Snatching defeat out of victory's jaws. Anderson piled on seventeen more. He hooked the Bucs: New York 9, Pittsburgh 1. Just long enough to each rack up a loss. Lefty Bob G and righthander Bob L.
L's only win was his twenty-first start. July the seventh  my first big league game. Homering twice; he'd hit three all year long. Two not quite ready and four past their prime. Young Cannizzaro would prove more endurable. Chiti was traded for none but himself. Came to an end with one swing: triple play! First to be drafted  then traded for Marv. One of the most revered ex-Brooklyn Dodgers. Called in September to show what he had. Kranepool arrived  and would stay 18 years. "Where's what's-his-name? Who's that guy playing third?" All took their turns at the hot-corner hollow. Giving us thirty-four reasons to cheer. Then there's DeMerit  the name says it all. Ruffing and Hemus - and Hornsby no less! Proving they too could be erringly human. Waited in vain for these Mets to deliver. One for each three that were sadly surrendered. "Can't anybody [here] play this here game?" Christened these lovable losers "Amazin'!" Wondrous beyond any logic or reason. Echoing groans and the cry "Yo lo tengo!" Proudly we hailed: "Let's Go Mets! Let's Go Mets!" On June 12, 1979 , the New York Mets set a team record for runs scored during an inning with ten in the sixth frame versus the Cincinnati Reds a record that stood for twenty-seven years until they broke it with eleven runs scored during the sixth inning (which saw a record tying two grand slams ) on July 16,2006 .